Also, been thinking this for a few pages now but hadn’t commented, I really like how Sigyn’s dress looks, it’s quite pretty! Sounds like my uncles! …. OK, now I want Loki as an uncle. Sounds like my Uncle Bob. He gave me $10.00 in pennies in a coffee can covered with duct tape. My sister got the same in a 6′ pvc pipe that he super glued closed. Thank you! And Loki as an uncle would probably be awesome. He would be the “Cool Uncle” who transformed into horses to let his nieces and nephews ride around on him. Can’t beat that. 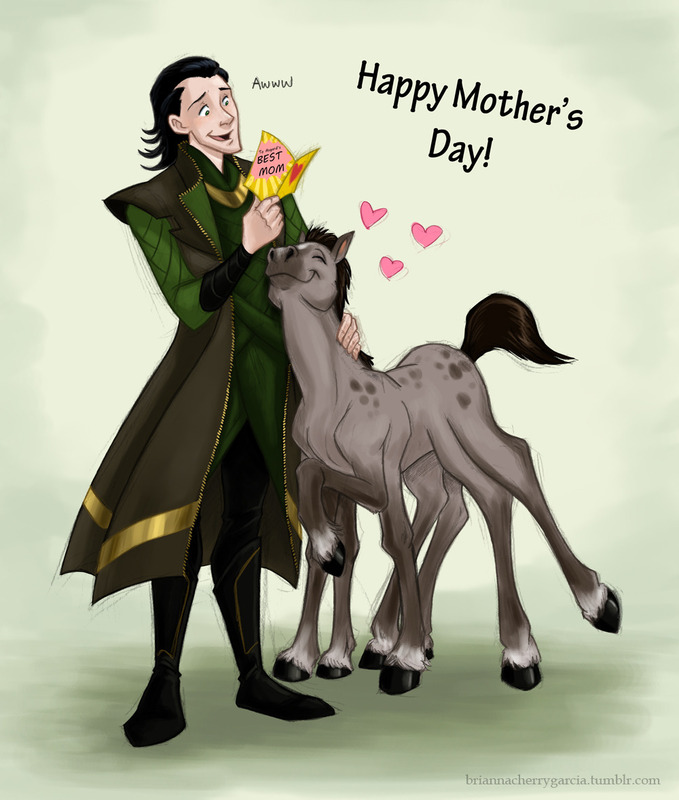 I would expect changing into a horse would be filed under “things to never do again” by Loki. Potential traumatic memories involving Slepnir, and things like that. Would I be wrong? Uncle? But I also think Loki as an uncle would be pretty great. Coal might not agree with you there, haha! 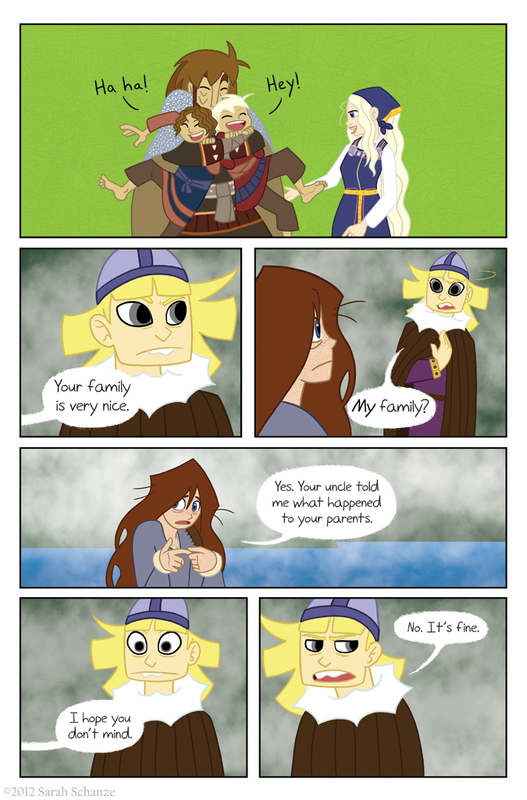 A jotun in the family is asking for trouble. Oh snap! Did Loki just refer To Coal as a kid? Loki wasn’t speaking in this page? I hope it’s not confusing that way. D: But I meant that Loki told Hedda he was Coal’s uncle. Oh not confused no, but I figured Loki insinuated (sp?) that Coal’s parents were dead and so he was living with his uncle. From what I have heard of Coal the very idea that he would need some sort of parental supervision would be a bit insulting! In that day and age, you didn’t live alone. Unless you were a hermit or other eccentric. It would have been quite normal for a grown man with wife and children to live with his uncle. Look at that, I learned something new today! So that’s what the laugh was, last panel. Yep! Loki wasn’t laughing at Hedda, because that would be really mean. Good stuff. Thanks for the comic! Keep it up! I’m excited to see how their voyage plays out. Looks like someone’s gonna be having words with his “uncle” about this. I keep telling myself to not read for awhile so I can read a bunch at once, but I just can’t help checking in every week. Haha, I certainly understand wanting to read in chunks! Once a week can be a drag, but I’m glad you check in every week anyway. 😀 Thank you! Thanks! 😀 And yeah he’ll have to do some fast talking when he meets those gods again. Sooooooo, what happened to his parents? I WANNA KNOW! I’m going to have to wait, aren’t I? By the way, I didn’t draw this but, Happy Mothers Day! Haha, yep, you’ll have to wait. :3 And yeah I’ve seen that drawing, I follow Brianna on Tumblr. XD Thanks!